I've probably used Python for over 6-7 years now and its really been my substitute for C when all I need is quick prototyping. This post should illustrate the power of Python and the great open source library support it has from the community. Requirements: You already have a Wi-Fi card capable of sniffing the air using monitor mode. I am using the ALFA AWUS036H. Now let me break up the whole process of writing the above. Step 2: Scapy can be run in interactive mode or used as a library. The interactive mode is great for quick prototyping and we will use this. 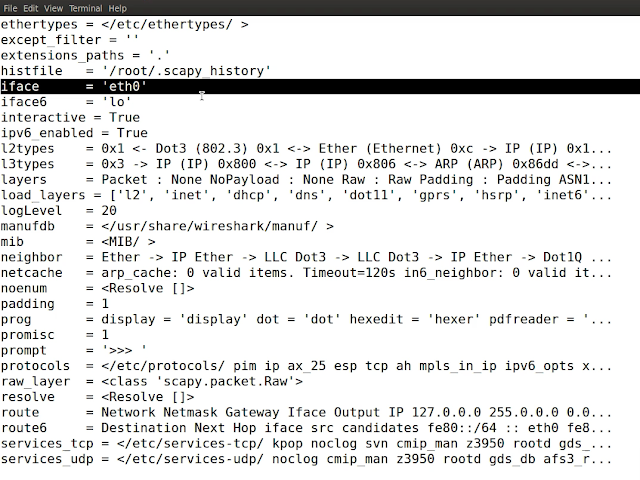 Run scapy and type in "conf" to see the current configuration. Step 3: Check for the value of "iface". The default interface is typically "eth0"
Step 4: Let set the interface to "mon0" out monitor mode wireless interface. Now we use the sniff() function to get packets from mon0. We specify the number of packets we want to sniff. Scapy will block till the time it does not receive that many number of packets. 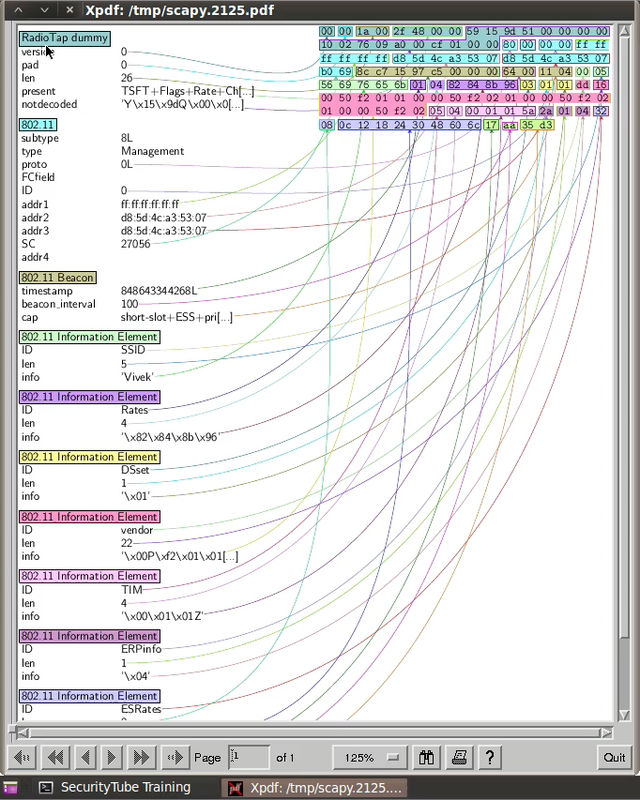 It returns the packets as a Python list. Step 10: We are almost done! Lets now write out the prototype as a standalone Python script. We now import scapy as a library we will use. Step 12: What we would really want is every time a new packet is received by our code, the PacketHandler function is invoked. Wouldn't it be great if scapy allowed us to define a callback function for every packet? :) Good news is - it does. All you have to do is mention the callback function with an additional argument "prn" to sniff. Step 14: Verification! Lets run the script. Step 15: Works Great! However, there is a small problem -- as every AP sends out tons of Beacon Frames we end up seeing the same access point over and over again. We need to do something to ensure that we only see new access points - so we have a comprehensive list of everything in the air. The solution is really simple - we define a list called ap_list and add new access points we discover to it (the MAC address). We only display the AP when it is first added. The modified code is below. Step 16: Let's run this now! I have this whole blog post explained as a 15 minute video on SecurityTube.net: http://www.securitytube.net/video/7262 This will help in case you need a more detailed explanation. Need more help with Wi-Fi Security or Python programming. Please checkout our paid courses on SecurityTube Training. 1. Print out more statistics about the Access Point such as the Channel, Rates etc. 2. Can you detect the Clients which are connected to the Access Point? 3. Can you write a program to sniff all the Probe Requests made by Wi-Fi Clients? This was a very helpful tutorial to me. I'm trying to do an additional step, retrieving the received signal strength from the packet. There's one way I found on the internet, explained here: http://comments.gmane.org/gmane.comp.security.scapy.general/4673. Basically, this gets the RSSI value like this: -(256-ord(pkt.notdecoded[-4:-3])), since it's in the notdecoded field of scapy. Yet as stated in the post itself, it's not the most clean or reliable way to do so. Do you have any suggestions on its improvement? Scapy does not parse the Radiotap header and that's why it is in the notdecoded field. Btw, I just posted a raw sockets version of this code as well: http://hackoftheday.securitytube.net/2013/04/wi-fi-ssid-sniffer-in-12-lines-of.html The radiotap header should be easier to get here. Awesome! You did not use "bind" and this can give you a ton of packets and you'd need to check if it is wireless or not. Can you let me know how this code could be changed to allow channel hopping? Would scapy have any API to allow us to define dwell time per channel? This is truly an informative sharing. 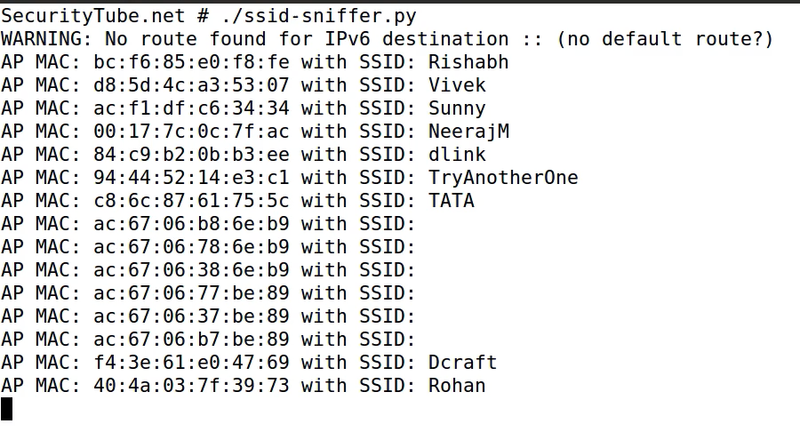 I really enjoyed studying this blog post and wanna appreciate admin for demonstrating everything nicely about WiFi sniffer in 10 lines of Python. Thanks.